We have found many patients do not have this coverage and it’s a burden on them during a time of high stress and injury. 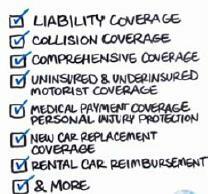 Please read to find out what you may be missing in your auto policy coverage and why. Commonly called PIP for short, personal injury protection insurance protects you against—you guessed it— personal injury. If you get in an accident, no matter who is at fault, PIP will cover the costs of your medical bills, as well as those of your passengers up to the limits of your policy coverage. You might choose PIP insurance if…. 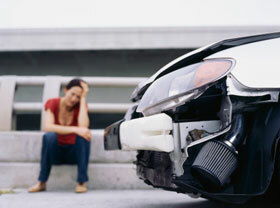 You drive around with lots of friends in your vehicle who could hold you responsible for their injuries in an accident. You don’t have a great health insurance plan (high deductible) or even if you do, often having great health insurance renders PIP/medical coverage far less useful. If in doubt, check with your healthcare provider. It is improper for medical practitioners to file to your health insurance for medical treatment as the result of a motor vehicle accident (MVA). If fault of the accident is proven to be someone other than yourself, YOUR insurance company may recoup paid medical bills from the at‐fault driver’s insurance company (depending on type and state of policy). Personal injury protection is a “no‐fault” coverage, meaning that even if you are determined to be at‐fault in an accident, medical expenses (such as medical and surgical treatment, ambulance fees, and medication) for you and your passengers will still be covered up to the policy’s limit. How much does PIP insurance cover? PIP coverage benefits will vary depending on the state in which you reside. For instance, in Florida, PIP insurance will typically cover 80% of medical bills and 60% of lost wages, up to $10,000. In other states, the coverage can be much higher or much lower so it’s important to be aware and ask your agent about specifics. Currently 15 states require some level of personal injury protection coverage: Arkansas, Delaware, Florida, Hawaii, Kansas, Kentucky, Massachusetts, Michigan, Minnesota, New Jersey, New York, North Dakota, Oregon, Pennsylvania, and Utah. In Texas PIP is AUTOMATIC at $2500 unless you reject it in writing (or electronic signature). You can add PIP anytime but you must have PIP active on the policy at the time of the accident to have benefits. The BIG question: how much does PIP cost? The cost of PIP insurance varies widely depending on a number of factors such as age, vehicle, and location. Call your adjuster today to find out. Generally PIP benefits will be about $14‐$25 more a year. Coverage in most states starts at a minimum of $2500 and can go to $20,000. Remember that an ambulance transport to an ER can cost, on average $1000, not including tests and treatment once there. If you have a health insurance policy, with a large deductible, then this cost comes out of your pocket until the deductible is met. Add PIP to your auto policy and protect yourself, your family and your friends. While we cannot advise you specifically on carriers, limits, and cost we will do our best to answer questions you may have. Reach out to Whole Family Chiropractors today to learn more!